A jury has found Toronto police Const. James Forcillo guilty of attempted murder in the 2013 shooting death of Sammy Yatim, but not guilty of second-degree murder, after six days of deliberations. A jury has found Toronto police Const. James Forcillo guilty of attempted murder in the 2013 shooting death of Sammy Yatim. Forcillo faced two charges related to the shooting death of 18-year-old Yatim on a streetcar in 2013, but was found not-guilty of second-degree murder. The jury believed Forcillo was justified in firing the first three shots at Yatim, but not the second round of shots, and hence was guilty of attempted murder. Forcillo said nothing as he left the courthouse around 5:15 p.m. surrounded by reporters and several Toronto police officers. At least one protester yelled "Killer!" as the officer ducked into a black SUV. Jurors reached the verdicts Monday after six days of deliberations. Forcillo, 32, had pleaded not guilty to both charges at the start of his trial, which began in Toronto at the Superior Court of Justice on Oct. 20. Peter Brauti, Forcillo's lawyer, said he has filed a "stay of proceedings," making the argument there has been an "abuse of process" in the conviction. Brauti added he was "concerned about a compromised jury" and said it was "trial by YouTube," a reference to the online video of the shooting taken by a bystander. If a stay is granted, Forcillo will again be presumed innocent. "This process is far from over," said Brauti. Yatim's mother, Sahar Bahadi, said she "would now like to be part of the discussion to change the police training policies when dealing with people in crisis so this painful incident does not repeat again." "Nothing in this world will compensate me for the loss of my son nor will anything bring him back to me," she said. "But I would like, for the sake of this great country, for the police to remain a source of confidence, security and respect for all people"
Bill Yatim said in a statement that he was "relieved" Forcillo has been convicted and that there are "no words to describe the pain I have endured," in the wake of his son's death. "I believe this verdict sets an extremely dangerous precedent throughout the policing community." — comment made in our CBC Forum. Read the full discussion here. In Sammy Yatim's final moments, court heard the teen asked the streetcar driver for a phone so he could speak with his father. That fact still haunts Bill Yatim. "I often wonder what would have happened if he had been able to reach me and if the police response had been different," he said in his statement, which like Bahadi's statement called for changes for the way police deal with people in crisis. Bill Yatim closed his statement by saying: "This simply cannot happen again." Mike McCormack, head of the police union, said the verdict sends a "chilling message" to Toronto police officers. "We're going to continue to pursue justice for Forcillo," he said, vowing an appeal. How did the jury decide that Forcillo was guilty of attempted murder instead of second-degree murder? It has to do with the sequence of the shooting, a legal expert explains. Read the full story here. Mayor John Tory called it a "terrible tragedy" but said it may bring about positive reforms in policing. "I think the public of this city still trust the police," he said. "But things come along. Trust is something that you have to earn it and keep it." He said steps are being taken to improve and modernize policing. Police Chief Mark Saunders said the force would continue to train officers in reduce harm in cases involving civilians in crisis and de-escalation. "We need to look at our training a lot better," said Saunders, saying the force is already working on ways to deal with people in crisis. Saunders said Forcillo will continue to be suspended with pay. Julian Falconer, a family lawyer for the Yatim family in a civil case against Forcillo, called it a "shameful day" for the police. He said for too long officers have had "immunity" in cases like this. He said those days are over. "It shouldn't be us against the police," he said. Forcillo was in court with his wife Monday. Yatim's mother and his best friend were also in the courtroom. Forcillo was charged after he fired nine shots at Yatim from the street as the 18-year-old, who was holding a knife, stood aboard an empty streetcar on the evening of July 27, 2013. Eight bullets hit the teen. Police had been called to the scene with reports about a disturbance aboard the 505 Dundas streetcar. Forcillo and his partner, Const. Iris Fleckeisen, were the first officers to arrive and found Yatim alone on the streetcar. The defence had argued Forcillo had grounds to fire his weapon that day, saying the officer was responding to Yatim's refusal to surrender. In his closing arguments at the trial, Brauti said Forcillo's perception of Yatim's behaviour and the threat it posed to him were important when considering a verdict. 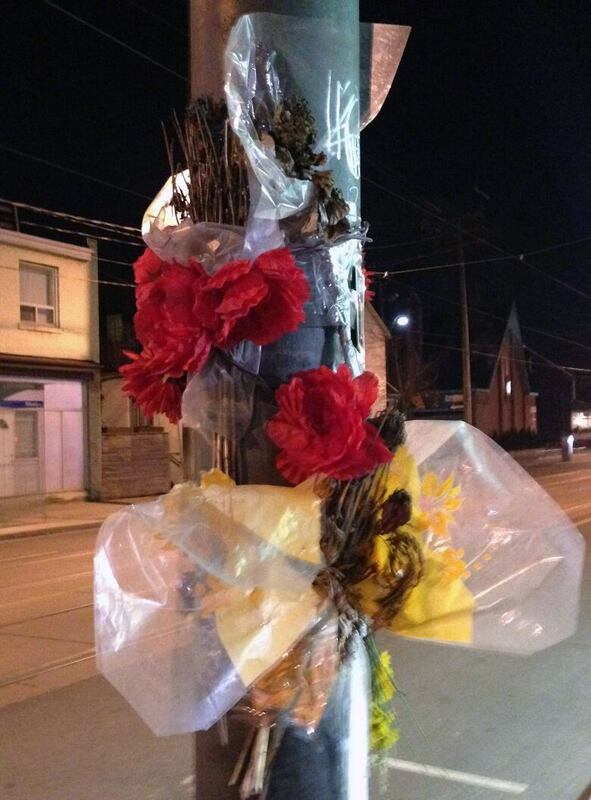 A shrine honours Sammy Yatim near the spot on Dundas Street where the 18-year-old was killed. (Joshua Errett/CBC)Brauti said the Crown's argument that Forcillo wanted Yatim dead was "ludicrous." He told the court it didn't matter if Yatim intended to attack Forcillo; it was enough that the officer believed he would. The Crown had argued Forcillo's actions were unnecessary and unreasonable. In closing arguments, prosecutor Milan Rupic characterized Forcillo as "a hothead and a bully" who expected Yatim's "immediate submission." Rupic said Forcillo could have used other options before resorting to lethal force. Nearly the entire confrontation between Forcillo and Yatim was captured on surveillance cameras inside the streetcar and by cellphones held by onlookers. The videos were played for the jury throughout the trial. The jury also heard Yatim had consumed the drug ecstasy before he boarded the westbound streetcar at Yonge Street. Moments later, the teen exposed himself to women on the streetcar and drew a switchblade, bringing the streetcar to a halt near Grace Street and sending passengers streaming out the doors. Video and audio recordings show Forcillo, who never boarded the streetcar, repeatedly yelling at Yatim to drop the knife. After about 50 seconds, Forcillo fired three shots from his handgun, followed by another six. The officer said during cross-examination by the Crown that he did not lose his cool during the confrontation. He said he stood by his decision to fire the initial three shots, but said that in hindsight he would not have fired the second volley. The case went to the jury on Wednesday after Justice Edward Then spent 2½ days giving jurors final instructions. He told them that Yatim's state of mind was not relevant during their deliberations, and to only consider Forcillo's state of mind. The judge also told the jurors they must decide whether they believe Forcillo's testimony that he didn't intend to kill Yatim when he shot him and whether, as Forcillo testified, he believed the shooting was necessary for his safety and that of others. Can't see the discussion forum? Click here.